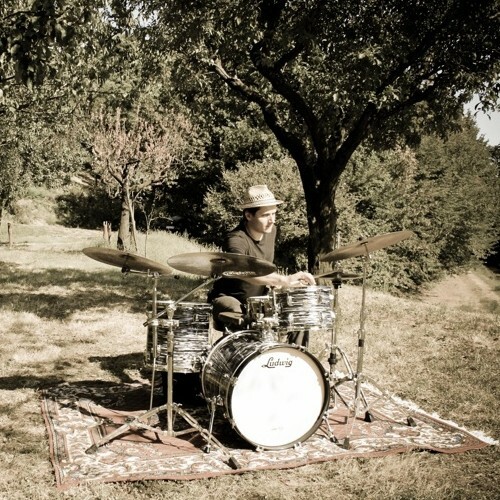 Gioele Pagliaccia is a drummer, percussionist and composer born in Marsciano (Perugia, Italy) but raised both in his native country and the United States. Thanks to his step dad he started playing percussion at the age of 8, untill two years later a friend lend him a drumset onto wich he would bang on for as long as 10 hours a day. Around that period he also started playing both acoustic and electric guitars wich he still plays and with wich he composes all sorts of music. He studied jazz at the Corvallis High School in Oregon and attended the “Berklee College of Music” seminars at the Umbria Jazz Festival in 1994, “Forme Sonore” with Roberto Dani in 2011 and “Living The Music” with Rakalam- Bob Moses in 2012. He performed in Italy, U.S.A., France, Dominican Republic, Germany, Slovenia and Japan.